Bhishma Ekadashi is on Thursday 18th February in 2016. Bhishma Ekadashi is observed in the Magha Maas which will occurs during the January and February. Fasting on Ekadashi is considered highly auspicious and is believed to help in redemption of sins and in attaining Moksha. On this day people also observe Bhoumi Ekadashi and Jaya Ekadashi. 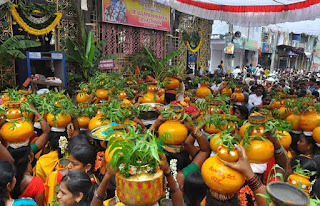 Bhishma Ekadashi occurs in the Uttarayan punya kalam. Bhishma Ekadashi will be three days after Bhishma Ashtami. Bhishma Ekadashi is also called as Matatraya Ekadasi. and Bhishma Ekadasi day also same ritual. Listing and chanting Vishnu Sahasranama Stotram is auspicious on this day. The story behind Bhishma Ekadasi is, Shantanava is the king of Bharat Kandh. Bhisma is the son of the King Shantanava and Ganga Devi. Actual name of the Bhishma was Devavratha and another name of him Gangeya beacuse he is the son of the Ganga Devi. As he made a promise (Bheeshna Pratigna) to his father that he never marry in his life because of his father second marriage. After the promise Narada Maharshi named him as Bhisma. In favor of Bhisma's promise his father gave boon that Bhisma's death is on his own hands. After the fathers death bhishma decided to do marriage of his brother Vichitra Virya. For that Bhishma selected the daughters of Kasi Raju they are Amba, Ambika and Ambalika. But Amba she want to marry other king. So, Bhishma Sent her back to the king. But king rejected her then she came back to Bhisma to marry her, then bhishma said as he promised to not marry so he said no. Then Amba went to Parushurama for help but she didn't get. After that Amba prayed for years to Lord Shiva. Lord Shiva asked for her wish she asked to get death of bhishma because of her, So he gave her the oath, In next birth she born as Shikandi. Shikandi was born as lady at young age she became man. Bhisma brothers son's were Drutharastra and Pandu Raju. Bhishma is great grand father of the Pandava's sons of the Pandu Raju and Kaurava's sons of the Drutharastra. Bhisma fights 9 days in Mahabharat war. On 9th day he leave his arrows because of Shikandi. Who was born to kill Bhisma. When Bhisma was about to fall on earth Arjuna built Shayya. Arjuna built with arrows it is called Ampa Shayya. Bhisma slept on Ampa Shayya until Uttarayan. because Bhishma has the boon to die on his wish he waited until Uttarayan that is the good time to leave the soul. On this day, Vishnu Sahasranama Stotram was revealed to Pandava's by Bhishma in the presence of Lord Krishna. As we believe that listening to Vishnu Sahasranama Stotram leads to Moksha. So, it is considered as the birthday of Vishnu Sahasranama.